Yes. Nicor Gas customers are allowed to choose another company (also known as an “alternative retail gas supplier,” or “ARGS”) to supply them with natural gas. This program is called “Customer Select.” Alternative suppliers sell their offers in a number of ways: door-to-door, over the phone and through the mail—but also at community events and through friends. We’ve even received reports of suppliers working through churches. WARNING: Right now, the regulated utility—Nicor Gas—is still probably your best choice. Your gas bill is divided into three main sections: delivery, supply and taxes. The “delivery” section is where the utility makes a profit, and covers the costs of maintaining the pipes, reading the meter, mailing the bills, and all the other duties relating to administration and infrastructure. You will always pay the regulated utility, Nicor Gas, for delivery; this is how the company makes its money. Also, if there is a gas leak or any other problem with your gas service, you will still call Nicor Gas. The “supply” section of the bill covers the cost of the actual gas you use. This is the part of your bill that changes if you opt for a different supplier. Traditionally, Nicor buys gas on the market and uses the pipelines to deliver that gas to your home. The utility is supposed to sell the gas at the same price it pays, with no markup. Choosing another supplier means that you will pay a different company to buy and supply that gas. 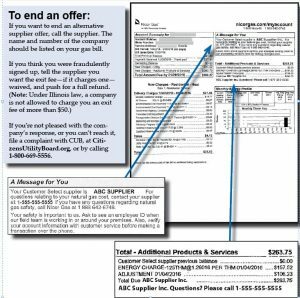 Although those charges will still appear on your Nicor Gas bill, they are actually being set by that other supplier—and unlike the utility, that supplier’s rates are not regulated or reviewed by the Illinois Commerce Commission (ICC). There’s no guarantee you’ll save money. Since 2003 CUB has been monitoring alternative supplier offers, and the consumer group has found that about 9 of 10 offers marketed by suppliers have been money-losers. Remember, you don’t have to go with another supplier. It’s optional. If you don’t sign up, you will continue to be served by Nicor Gas with rates regulated by the ICC. 5) If you don’t want unregulated gas companies to bother you, get on your utility’s do-not-market list. Nicor customers should call 1-888-642-6748.